We all love to get together, share a meal and perhaps a drink, so why not do so but also do something good at the same time? This Saturday Soiree is a Donation Dinner. The plan is simple, make one of your favorite crowd pleasing recipes and ask that, in lieu of a hostess gift your guests bring a small donation to a charity of your choice. Two charities that I support are the ASPCA and Save the Children, just pick a cause that is important to you. Be sure to place a basket close to your door for your guests to put their donations in, along with blank envelopes and a sign that says, " Thank You". For the pork- mix together all spices and massage into pork loin. Heat oil in an ovenproof skillet, and brown pork, about 2 minutes on each side. Keep pork in the skillet. For the glaze- stir together brown sugar, salt, Tabasco and pat onto top of loin. Roast in the middle of the oven for 20 minutes. Let pork stand in skillet at room temp. for 10 minutes. Whisk together juices, mustard, curry powder, salt and pepper, and add oil in a slow stream, whisking until emulsified. While the pork stands, prepare the salad by cutting peel and white bits from oranges then cut crosswise into 1/4 inch slices. Toss spinach, cabbage, bell peppers and raisins in a large bowl and 1/4 cup vinaigrette. Halve, pit and peel avocados and cut into 1/4 inch slices. Cut pork at a 45 degree angle into 1/2 inch slices. Line a large platter with dressed salad and arrange sliced pork and avocados on top. Drizzle remaining dressing over dish and pour any juice in skillet over the salad. Bon Appetit! Appetizer: Pimiento Cheese from earlier in the week with vegetable crudites. Music: A fun Motown mix with classic oldies. 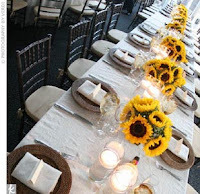 Decor: Yellow checked tablecloth with pink napkins, rattan chargers and bouquets of sunflowers. Of course, I always like to scatter tea lights for some extra twinkle. Drink: Pinot Noir- I recommend Cloudline and Thousand Foot. Both are inexpensive and delightful in the summer heat. Also, serve sparkling lemonade. Dessert: Roast Figs with Greek yogurt and honey. Slice and roast fresh figs for 12 minutes. Arrange on dessert plates with a dab of Greek yogurt, a drizzle of honey and chopped pistachios. This entry was posted on 12:15 PM and is filed under dinner party ideas , donation dinner , island pork tenderloin salad . You can follow any responses to this entry through the RSS 2.0 feed. You can leave a response, or trackback from your own site. I just stumbled on your blog, and it's adorable. This dinner part looks incredible! What a wonderful idea! This would be perfect for our holiday party that we throw each year. Thanks for the great idea! Great idea! Not only great food but supporting a great cause at the sime time! I also love the sunflower table decorations. Thanks for visiting my blog and entering the giveaway! That table setting is GORGEOUS... food sounds divine too! fabulous and I LOVE the idea of the charity donation! Yum, I want some! What a great recipe, thanks for sharing. I LOVE this idea! This is fabulous- and animal charities are one my big passions. Thank you for sharing your recipes as well! I'm writing down those Pinot recs! Love the sunflowers!